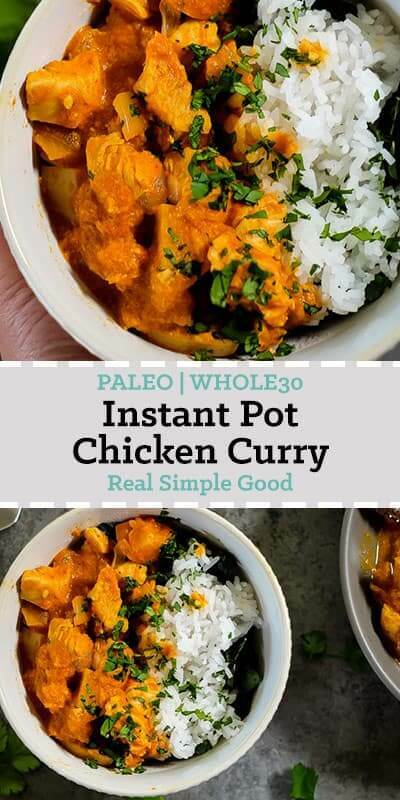 If you have been following along with us for a little while, you’ve probably noticed we love using our Instant Pot to create Paleo + Whole30 recipes, and we love easy dinner recipes that taste like you spent a lot more time and effort than you really did. 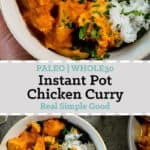 This Paleo + Whole30 Instant Pot chicken curry is super tasty and a great make ahead meal or also a fantastic quick weeknight dinner. 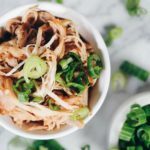 If you’re like us, you weren’t quite sure how to harness the power of your Instant Pot when you first got it. And maybe you’re still kind of trying to figure it out. That’s perfect! 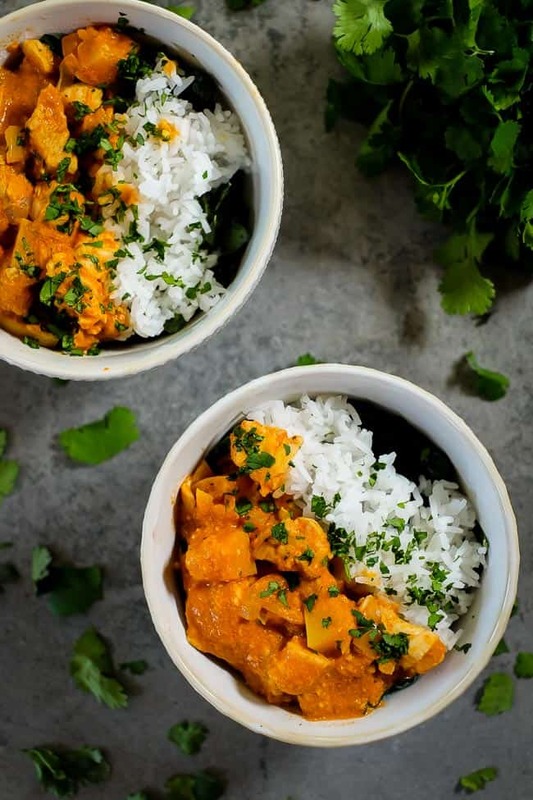 This Instant Pot chicken curry is a great way to add the “sauté” function to your bag of tricks. 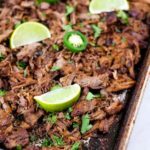 We love the sauté function for browning and locking in moisture into the meat or poultry we are cooking in our Instant Pot. After you get the cooking started with the sauté function, you can then add the rest of the ingredients and pressure cook everything. 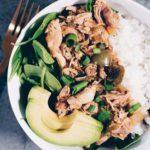 Of course, once the Instant Pot curry chicken is done, we like to make it into a full meal, bowl style! We start with a base of greens, whatever you have on hand. We essentially add greens to all of our meals. Then, we layer on some cauliflower or white rice (depending on how strictly Paleo you are). Add some curry chicken and spoon on extra sauce. You’re likely to go back for seconds…just sayin’. The debate on white rice. Ok, here we go. White rice is a grain. Correct. And grains are not Paleo. Correct. But we eat white rice? Yes. This is a personal decision for everyone, and it definitely depends on what your goals are. White rice is very easily digested and seems to make my stomach feel pretty good, so I tend to have some, usually about once a week or so. Maybe twice some weeks. 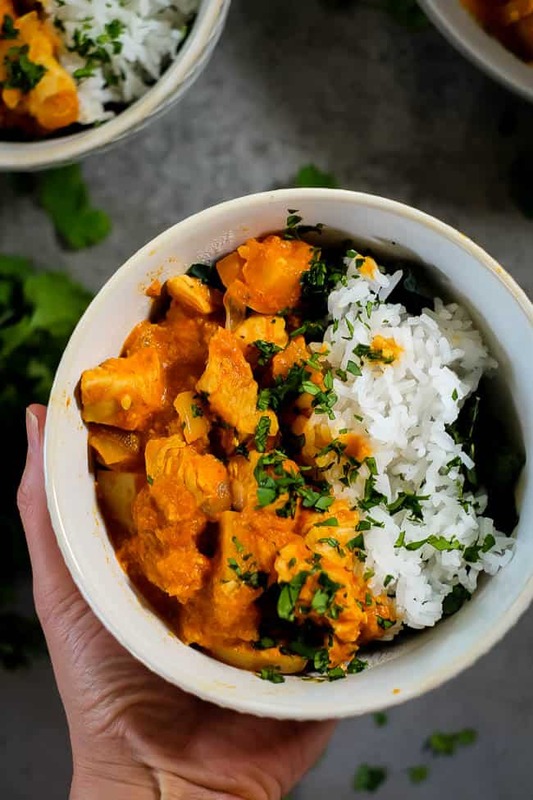 If you are very strictly Paleo or want this Instant Pot curry chicken to be Whole30 compliant, stick with cauliflower rice! 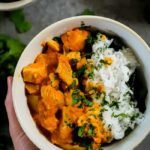 Looking for a pretty quick and easy meal – make this Instant Pot chicken curry! 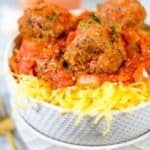 It’s flavorful and feels like comfort food. Let us know how it goes and what you think by leaving a comment below. Also, take a picture and share it on Instagram! Tag us @realsimplegood, so we can check it out! Then, give us a follow on Instagram if you don’t already! We’d love to stay connected! 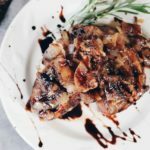 Cut up chicken and season it with salt and pepper, set aside. Cut up squash, garlic and onion as noted. Press the “Saute” button on the Instant Pot and add coconut oil. Once hot, add the chicken and squash and saute for 5-6 minutes. Stir to try and cook the chicken a little on all sides. Press the "off/cancel" button and add the rest of the curry ingredients into the pot. Stir to mix. Close the lid, seal the vent and press the "manual" button (or "pressure cook" button) and set the time to cook for 8 minutes at high pressure. While the curry is cooking, prep your cauli rice or regular rice. 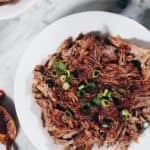 Once the Instant Pot cooking time is up, let the pressure naturally release on its own for 15 minutes and then quick release any remaining pressure. Remove the lid and give the contents a good stir to mix. Taste and season with additional salt and pepper as desired. 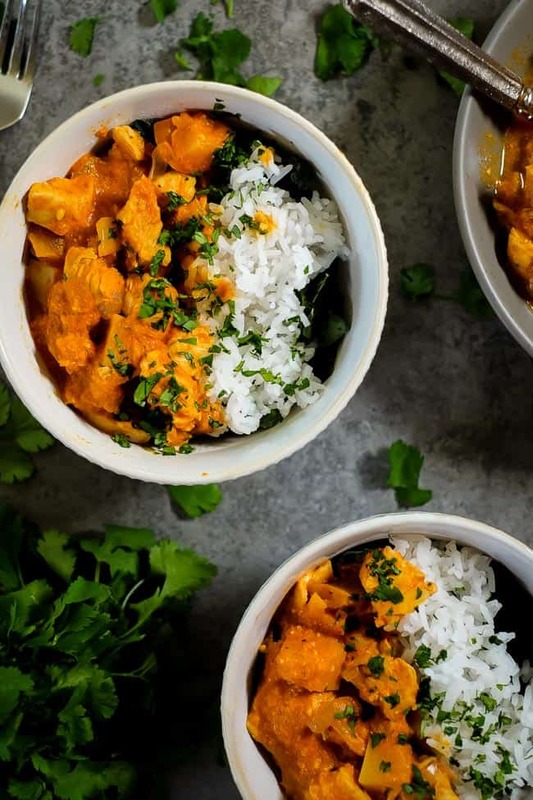 Serve the chicken curry over cauli or regular rice and garnish with chopped cilantro. 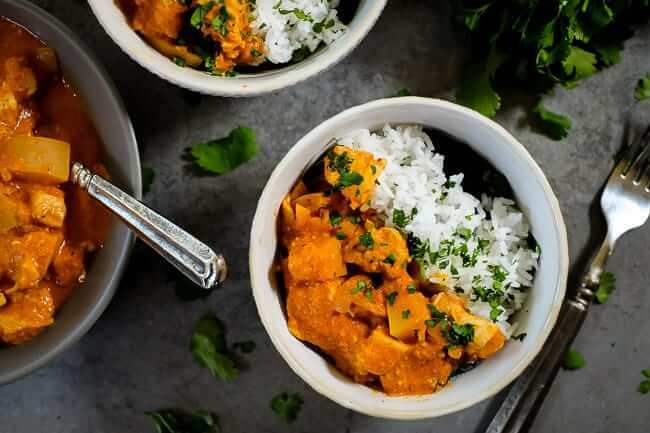 Do you substitute same amount of dry curry for the curry paste? I’d try it first with 1 tbsp, and then if you want more the next time try more. Hope that helps!